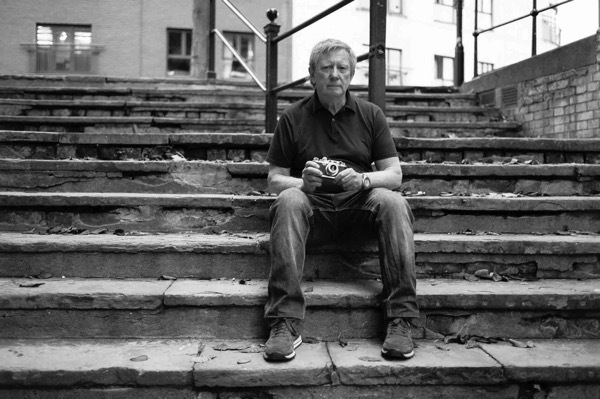 Contributing Photographer Colin O’Brien is giving a Magic Lantern Show at Bishopsgate Institute next Thursday 19th November at 7:30pm, showing his photographs of Clerkenwell and beyond, and telling the stories behind the pictures. Click here to book a ticket. 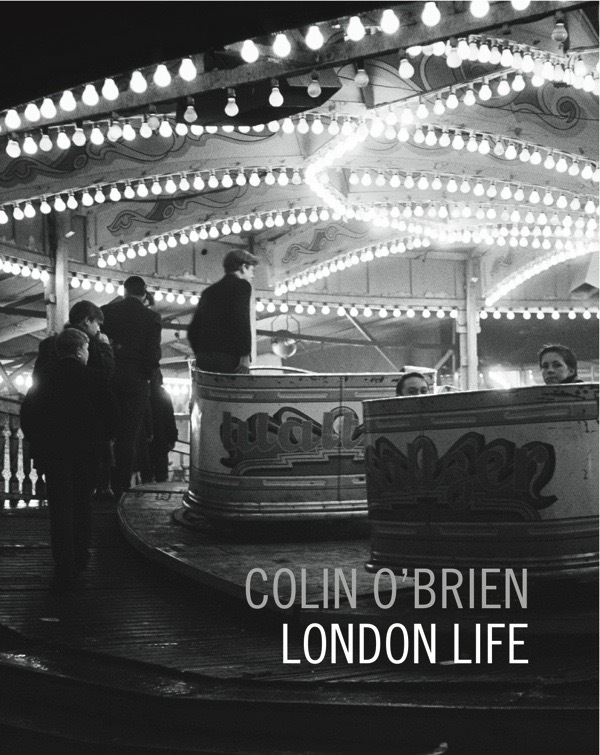 Many of Colin O’Brien’s early photographs were taken with a Leica camera that he received ‘off the back of a lorry’ when he was growing up in Clerkenwell in the fifties. 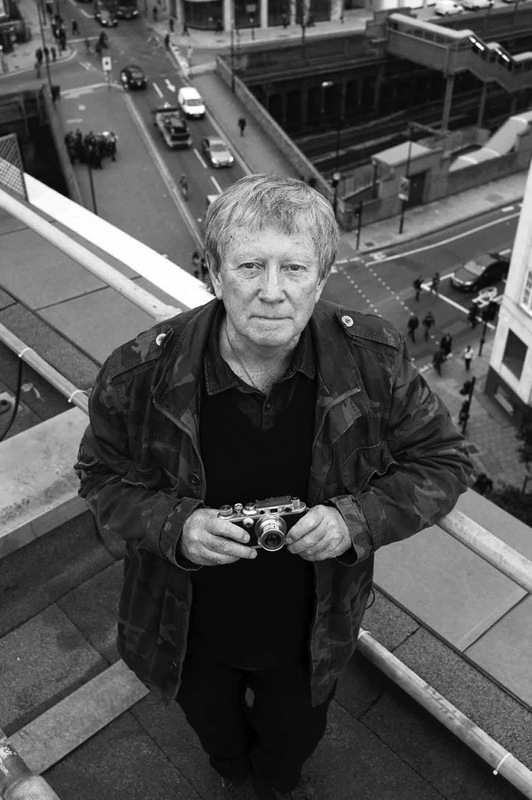 Recently this was restored again to working order for Colin by Leica, prompting him to make a sentimental pilgrimage to his old neighbourhood with his cherished camera. “It was an exciting day when I held my 1931 Leica again, newly-restored and working for the first time in more that forty years. My photographic journey has been an eventful one – starting with a box camera and ending with a digital monster that includes a setting for any photographic eventuality. There were many cameras in between but my favourite was always the Leica. This camera served me well in the fifties, sixties & seventies and I welcomed it back as if it were a long-lost relative. When I pulled out the 3.5cm Elmar lens, looked through the viewfinder and fired the shutter, it sounded good. 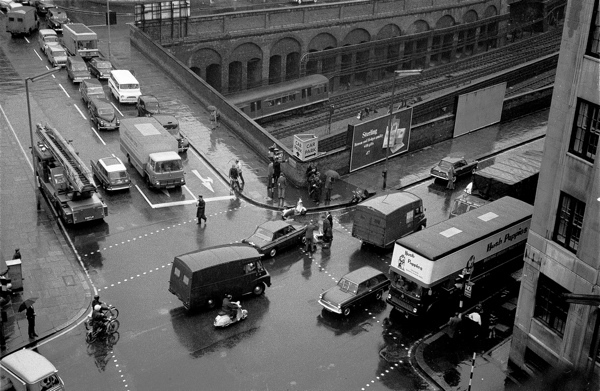 The Elmar lens was the same one I used to take accident pictures with at the crossing of Clerkenwell Rd and Farringdon Rd in the fifties and sixties. The next step was to buy a roll of film and shoot some pictures again. Way back in my youthful Leica days, my eyesight was perfect, my hands were supple, my brain activated more quickly and my limbs bent without creaking like an old wooden sailing ship. The repaired camera felt heavy and solid to the touch and it was only when I realised that it did not have an exposure meter or auto-focus and – after each frame – it had to be wound on manually, that I discovered I would have to remember how to do all these procedures in an instant if I stood any chance of capturing the passing scene. Yet it was amazing how it all came back to me. A quick movement of the split image rangefinder to focus, an estimation of exposure based on experience and the tolerance of black and white film to under- or over-exposure, switching from the rangefinder to the viewfinder, and pressing of the shutter release placed conveniently on the top of the camera. ‘It’s as simple as that,’ I thought. Or is it? I followed the same procedure for my next shot, but nothing happened. I had forgotten to wind on the film. 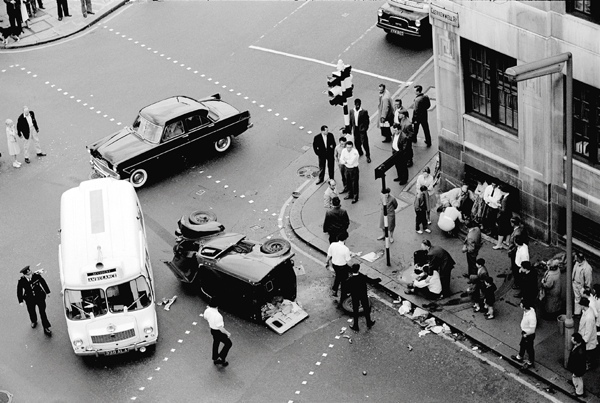 Arriving in Clerkenwell, the memories came flooding back – mum and dad, my relatives, Mrs Leinweber and the kids I used to play with on the surrounding bomb sites. Only today it is different. Pret A Manger stands on the corner of Clerkenwell Rd and Farringdon Rd where the Metropolitan Tavern once was. Victoria Dwellings, the tenement where I grew up in the forties and fifties, has been replaced by so-called luxury flats. Where once stood Booth’s Dry Gin Distillery there is now a new office block and the hoarding is gone that displayed the ubiquitous Guinness advertisements which were part of my growing up. What still remains are ‘the steps,’ where as kids we used to meet before setting out to play our games of Hopscotch, or Cowboys & Indians. 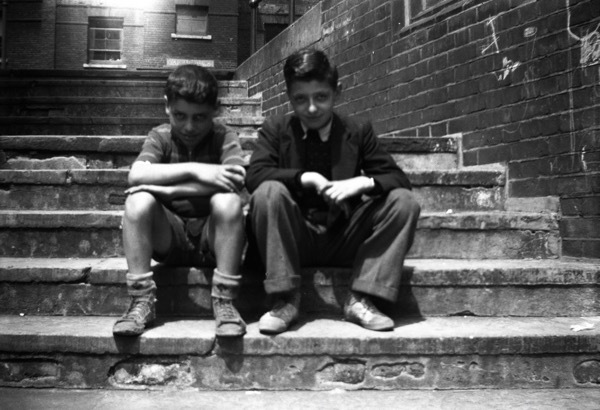 I sat on the steps where Razzi Tuffano and Pidge Boffer sat way back in 1948 on the very spot where I raised my box camera to take their photograph. 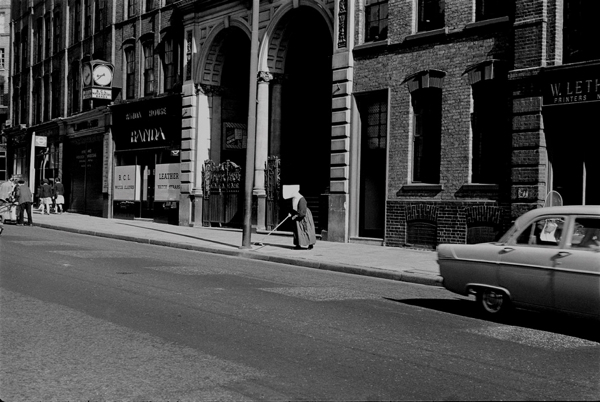 The Italian church is still there in Clerkenwell Road where I took the picture of the Carmelite nun sweeping rubbish into the street from the building next to the church where they lived. Amazingly, the door to the church was open and I went inside. It was like entering another world from the drabness of the dull street walking in to the ornate Italian decoration of the Church. The place was empty. I stood looking at the altar where I used to be an altar boy in the forties and from where I once set off with the Italian Procession, an annual event which still happens today. I remember Beniamino Gigli coming to the church to sing and they put up speakers outside so that more people could hear him. It was strange to be back in this church again, which had meant so much to the Italian and Irish immigrants of Clerkenwell, including my own family and relatives, who lived in the area all those years ago. Thank you for this evocative posting. 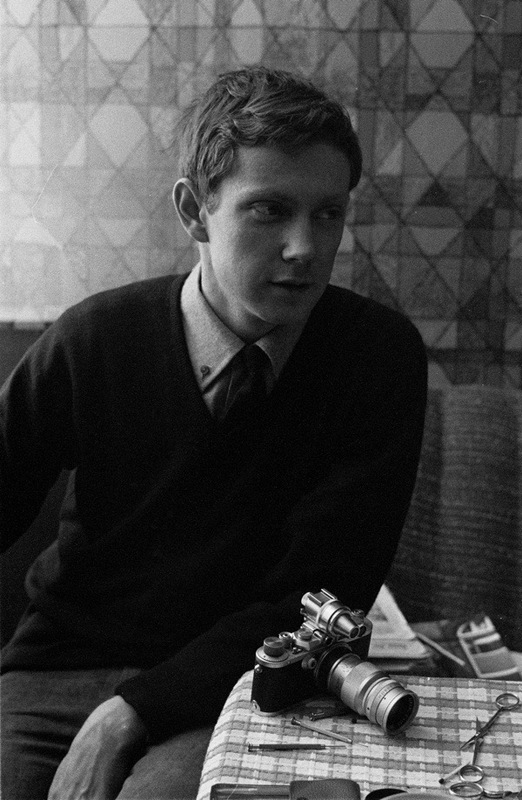 My husband’s grandfather arrived in Holborn from Italy many years ago and my aunt was an O’Brien so as a family historian bells were ringing loudly for me throughout Colin’s story. How good it is that that camera fell off the back of a lorry into a pair of such certain hands. Colin O’Brien is a great photographer. I would like to be there! Beautiful photos. So simple and vivid. 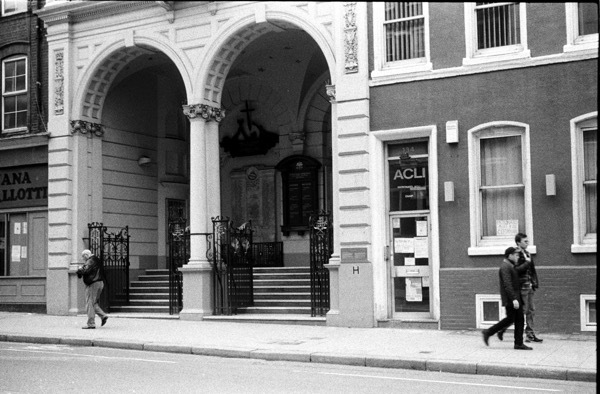 I well remember the first time I walked through Clerkenwell and the Italian church there back in the late 70s. 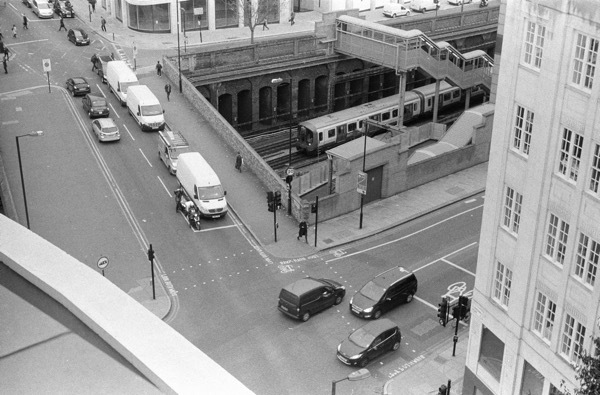 A glimpse of a previously unknown part of town just 10 minutes from Barts Hospital where I was a student nurse. That, by the way, GA, would make an excellent photo story as it changes from hospital to homes. 800 years of history. Would gladly take you round and tell you of yesteryear. You have only to ask. We have a Leica camera like this one that my husband bought when he was a national serviceman in Hong Kong, but, sadly, my eyesight does not let me use it. Photos that my husband took with it were brilliant though and some of these, of Hong Kong, can now be seen on the Gwulo website, I know that I am biased but I think that they are the best black and white photos there. Thank you again GA for yet another interesting article. 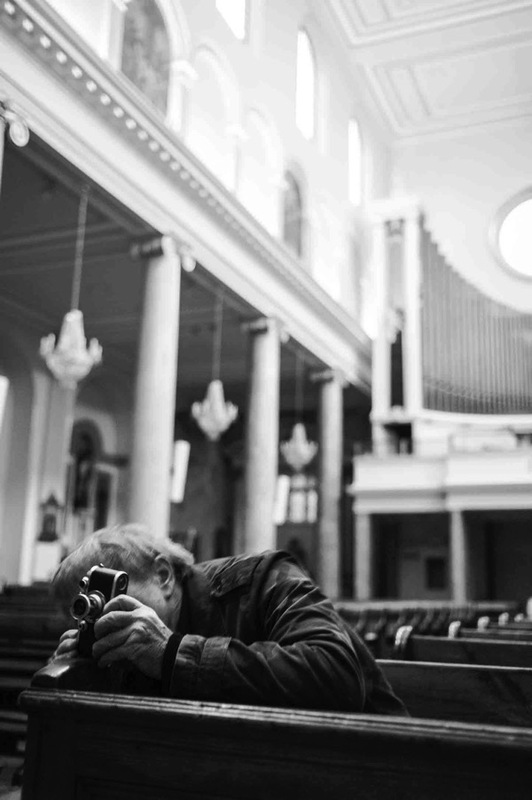 Loved the juxtaposition of the old photographs with their contemporary parallels and loved the way Colin told the story of his re-born Leica. What a great moment to hold the long-lost friend of years ago and have the familiar feel of it it one’s hands again.